He was born on the 10th of January, 1958 in Kebirli village of Beylegan region. After finishing school #5 in Agdam region, he entered Azerbaijani Medical University in 1975. When he graduated from the university in 1981, he worked as a doctor in Khankendi region for 7 years. When armenian militants started attacking Azerbaijani lands in 1988, he was forced to change his workplace to Agdam Central City Hospital. He worked for a short time in Emergency Department. Then he started working as a chief doctor in a military hospital in Agdam region in March 1992. After Khojali tragedy, he used all his knowledge as an experienced doctor during the battles for the sake of Nakhchivanik, Aranzemin, Pirjamal and Aghbulag villages. But unfortunately he died heroically on the 16th of June, 1992 while on duty in Nahchivanik village. 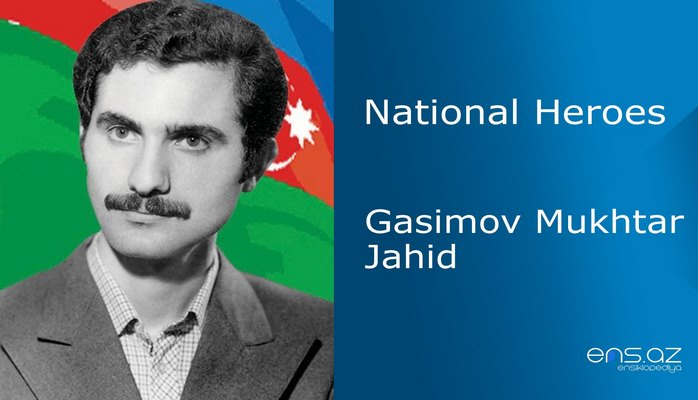 Gasimov Mukhtar Jahid was posthumously awarded the title of the “National Hero of Azerbaijan” by the decree #457 of the president of the Azerbaijani republic on the 5th of February, 1993. He was buried in the Alley of Martyrs in Baku city.